Fabulous custom ranch with walkout basement on 5 acres in Keene Ranch. Magnificent architectural design and floor plan. Stunning entry overlooking the great room with vaulted ceilings, exposed beams and panoramic views. Magnificent floor to ceiling rock fireplace. Extensive hardwood floors. Wrought iron staircase. Gourmet kitchen with knotty alder cabinets, Wolf gas stove, wine fridge, huge island, breakfast nook and pantry. Elegant master suite with updated master bath, large walk-in closet and access to deck/hot tub. Main floor study with custom built-ins. Formal dining. Beautifully finished walkout basement includes: family/game room with fireplace and wet bar, 3 bedrooms and 3 baths, exercise room and ample storage. This floor plan and layout is an entertainer's dream. Spacious covered and uncovered deck with spectacular views. 4 car garage and extra parking. 1 year old roof. Great access to trails and open space. 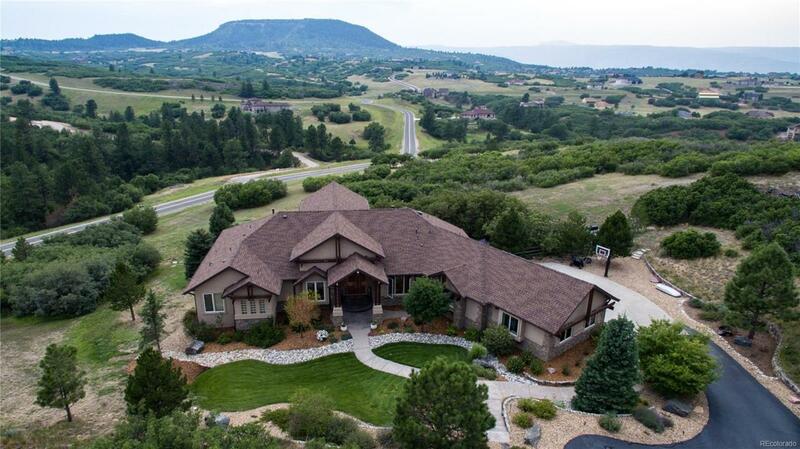 This incredible home offers true Colorado living at its best.